Research identified children were most at risk between 9am and 1pm. During this time 40% of injuries occur, ranging from a simple cut to more severe accidents such as burns or drowning. A pioneering programme to safeguard young children during peak times of risk has been developed. Though supervision, children are kept safe while their parents are busy with daily activities, such as cooking or going to work.Anchal was established not only as a day care centre to help children have an injury free environment, but also to help in the development of children. Anchal is a unique approach to providing a safe environment for children – resulting in a reduction of injuries and fatalities. An Anchal is a Centre managed by a trained ‘Anchal Ma’ (supervisor) who provides childcare and allows opportunities for children and parents to learn about health, nutrition and personal hygiene. Around 20-25 children under the age of 5 are enrolled in each Anchal, which remain open from 9 am to 1pm, 6 days week. Anchal is 80% protective from injuries . 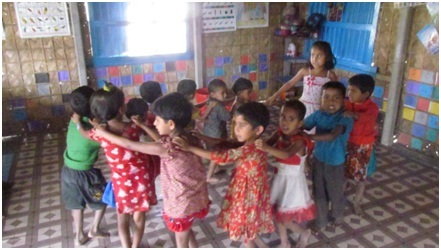 The Anchal programme provides appropriate stimulation for linguistic development, motor development, improved social, moral and emotional skills and provides access to preschool education preparing children for the often daunting transition into primary education. Anchals provide an opportunity to practice personal hygiene (hand washing, cleaning teeth, and cutting nail). We are accustomed to seeing mothers as the primary caregivers, who are perceived to have a better control over the home. Based on this belief, each Anchal has two female caregivers known as an ‘Anchal Ma’, who take care of the children within an Anchal after training. Anchal Ma’s also help to educate parents about preventing the risk of injuries to their children through raising awareness of the problems and suggesting some simple solutions. Anchals allow parents to work by providing a safe place for their children to be supervised during the daytime. Thus, Anchal provides an opportunity to increase parents’ productivity at work, especially for women, which can lead to a reduction in poverty, and ultimately, will help in the social and economic development of Bangladesh. Anchal helps accelerate community development through bringing parents and other community members together to discuss ways to prevent injury and promote ECD themes.